I’ve been in the Spanish colonial city of Granada, Nicaragua for the past few days. 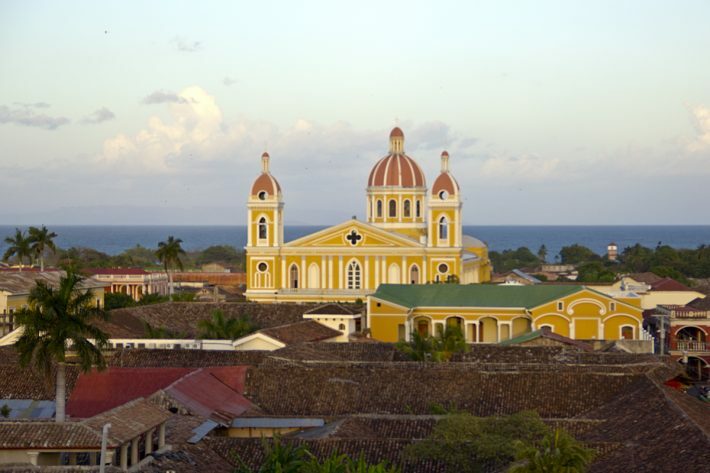 Granada is the oldest Spanish founded city in Central America and was founded in 1524. The beautiful Spanish architecture is further accented by the city’s proximity to Lake Nicaragua, which is the largest lake in all of Central America, and the second largest lake in all of Latin America behind Lake Titicaca of Peru and Bolivia. The picture above was taken from a very popular photo spot, a bell tower of one of the city’s many churches. Pictured is the main cathedral of the city, which sits in the central park of the city, and behind that Lake Nicaragua. As always you can click on the photo to enlarge it for a better view. Very beautiful! Love the architecture and the contrast of colors. Cathedral really stands out! Thanks Jeremy, it was a great view and I’m glad the photo turned out like it did! So pretty! Such vivid colors. Yea it is a very colorful town! Gorgeous photo. Like Jeremy, I am a big fan of the contrast of colors with the yellow overlapping the blue from the lake. Very nice photo, Matt! I love how vibrant the colors are. I love the moniker ‘skyline’. That picture turned out really well. Great photo, seems like you caught it a really nice time of day! The illuminated yellow / gold is beautiful. Great shot! haha i went up that church! !